In adding 804 residents, Oconee County nearly matched the 807 added in Walton County and just beat the 802 added in Barrow County. Because those two counties have a larger base, their rates of growth were below those of Oconee County. Clarke County was the real center of growth among the counties surrounding Oconee County. It added 3,552 individuals, representing a growth rate of 3.0 percent, the highest among the seven counties surrounding Oconee. The data, released yesterday, are from the Census Bureau's Population Estimates Program (PEP) and do not represent real counts. Actual counts occur only every 10 years, with the last in 2010. The Census Bureau utilizes data on births, deaths and migration to calculate population change from the most recent census. The projections are just that, and the Census Bureau in 2010 counted fewer residents in the county than its earlier projections indicated would be the case. The population actually grew 25.1 percent during that 10-year time period. The reference point for the change rates reported by the Census Bureau yesterday is April 1, 2010. Oconee County had an estimated 32,815 residents on that date. The actual Census Bureau count for Jan. 1, 2010, was 32,808. 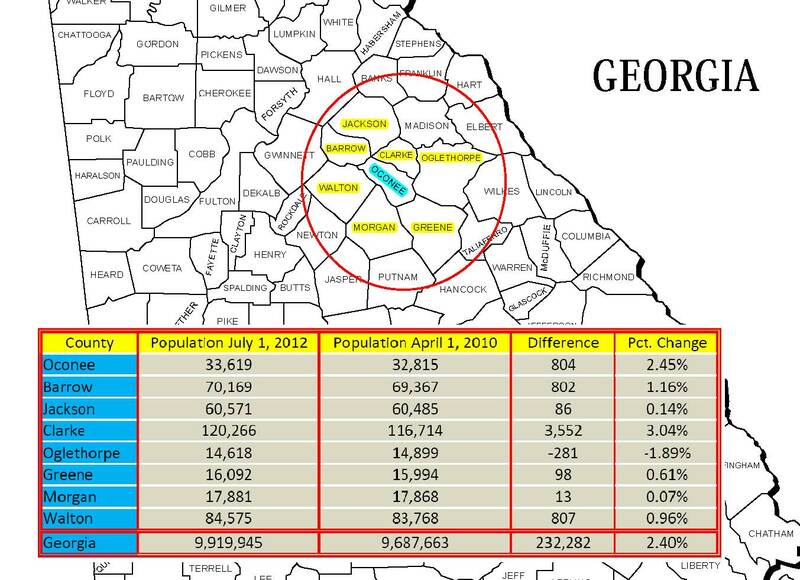 Oglethorpe County lost population between 2010 and 2012, according to the Census Bureau. It was the only county of the seven that Oconee borders that did not add residents. Greene, Jackson and Morgan counties added fewer than 100 residents. The growth rates in none of the counties other than Oconee and Clarke were more than 2 percent. 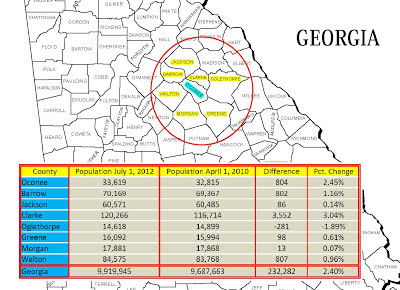 The Census Bureau last year projected growth of just less than 1.7 percent (551 individuals, or 36.7 per month) for Oconee County for the 15 months from April 1, 2010, to July 1, 2011, so the increase of 253 individuals in the next 12 months (21.1 per month) represents a slowdown in growth. Population estimates are used by government officials to gauge needed services, which often require years to bring online. The average household in Oconee County, according to Census Bureau data, contains 2.87 individuals, so the 804 individuals added in the April 1, 2010, to July 1, 2012, period represents roughly 280 households. Oconee and Walton counties have used strong growth rate estimates to justify construction of Hard Labor Creek Regional Reservoir in Walton County. That project was slowed down when the housing market in the two counties collapsed and demand for water was less than projected. The two counties are moving forward with construction of the dam and reservoir intake and pump, but they have not made any decision about when to build the water treatment plant and the water transmission system. Estimates of population growth for each of the state’s counties are available from the QuickFacts feature of the Census Bureau web site.